Some very exciting things have been coming out of FFG over the past couple of days, some of it already announced at GenCon, but some new. Let’s take a look! To start with, the very exciting news about Under the Pyramids, the new big box expansion for Eldritch Horror. Last year saw Mountains of Madness come out, which brought a sideboard to the game, along with a lot of additional bumph that you can see in my blog here. Under the Pyramids seems to be following that template, with a new board that depicts – unsurprisingly – the Egyptian desert. Two new Ancient Ones, of which only Nephren-ka has been spoiled, along with eight more investigators and a whole host of other new bits. I’m guessing Nyarlathotep will be the second Ancient One, though given the breadth of lore for him in the mythos, he may be better-placed in a box by himself. We’ll see, though. Something that sounds like a lot of fun is the Museum Heist adventure – no idea how this will work mechanically, but it just sounds like a lot of fun! Hoping we’ll get this for Christmas! 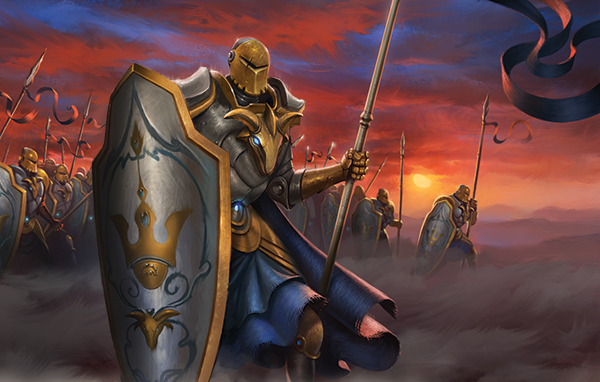 Just announced today is the seventh hero and monster collection for Descent – Treaty of Champions! Looks very much like more of the same, really, though take a look at those miniatures! Those demon lords look absolutely amazing. Interestingly, while I said this was more of the same, there is a new monster group, the Crow Hag! An interesting-looking mini, some strange cultist-like character with a huge mace of some sort… interesting! Always great to have exciting options for a game, anyway! Have I mentioned the new cycle for Warhammer Conquest? I’m not sure… At any rate, the next cycle is expected to begin at some point, and it mainly deals with interacting with the position of planets. Capitalizing on the fact the deluxe expansion, The Great Devourer, will be released by the time this hits, we’ll also be getting Tyranid cards, and the fourth pack, What Lurks Below, brings a new Warlord to the faction. In keeping with the first cycle, it also looks like the Space Marines will be focusing on a new chapter, this time Black Templars. 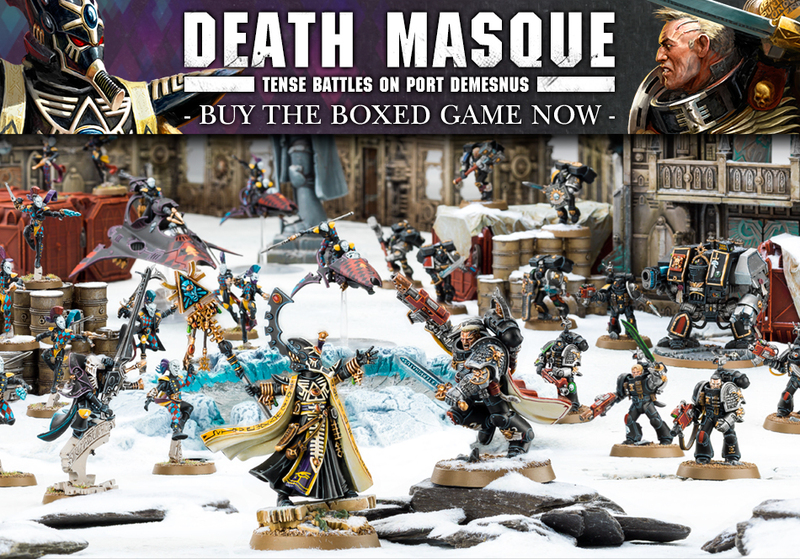 Interesting, as I’d have thought we’d be seeing something like Blood Angels or Dark Angels first. 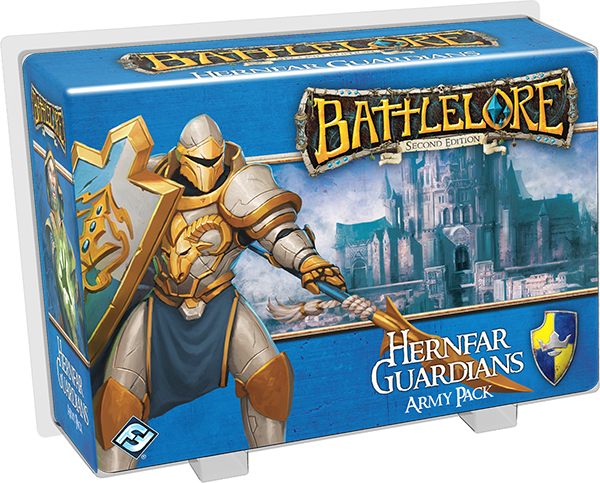 At any rate, I wasn’t actually intending to keep buying Conquest packs after the Warlord cycle ended, but FFG are always so very good at keeping me hooked on their card-crack! I realise I’ve not mentioned the other big, exciting expansion announced back in GenCon, Return to Hoth! I’ve actually played the skirmish game once, and thoroughly enjoyed it, but have wanted to play more before featuring it on the blog. Anyway, it’s a really exciting game, and Return to Hoth looks like it has some very good additions to this! The miniatures include HK-droids, Wampas, and a Mon Calamari hero, all of which look excellent. The associated ally and villain packs also look good – Princess Leia, Dengar, and some Snowtrooper chaps, all look fantastic! Interestingly, there is a lot in this box that seems to support the skirmish game, including a four-player variant, which makes me wonder if FFG are keen to support this aspect above anything else. It does kinda make sense, given the opportunity for organised play. The skirmish game is certainly the more popular aspect as far as what I’m seeing locally, at any rate. Another one for the Christmas list, anyway – all four of these things are coming before the end of the year, anyway. The Imperial Raider is apparently in stock at my local store, though it is so overdue that I don’t think I’ll actually believe it until I’ve seen it with my own hands! After the heady excitement of my Birthday Week, and the exploration of the Indiana Jones franchise, it’s back to Star Wars, my original true love, and some exciting news for gaming, following the Anaheim shenanigans last weekend! Let’s start with Wave 7 for X-Wing! Releases for this game continue apace, as we get new ships for all three of the current factions. The K-Wing makes an appearance for the rebels, something I’ve been particularly pleased about since I’m a big fan of the Black Fleet Crisis trilogy. It also gets a new move, SLAM, which basically allows it to move twice, so long as both movements are at the same speed. The Imperials get the TIE Punisher, though most people will probably know it better as the TIE Interdictor from the Galactic Battlegrounds game. 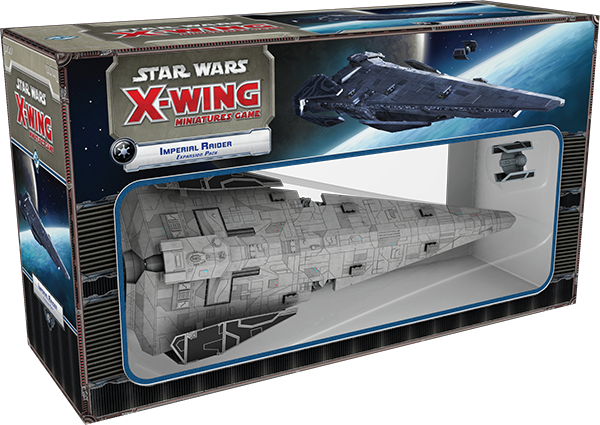 It’s basically an advanced version of the TIE Bomber (from Wave 3), and both this and the K-Wing have some pretty snazzy ordnance they bring to the table. Very useful is the Advanced Ordnance card, which lets you use missiles and bombs twice, so that’ll most likely become a staple! Scum takes up half of this wave, which makes sense, given they’re still quite far behind the other factions so far. Black Sun’s Kihraxz fighter makes its appearance, which has got me excited to build a Black Sun squadron, and Trandoshan bounty hunter Bossk’s ship Hound’s Tooth rounds out the experience. He has the ability to escape his destroyed ship in the headhunter Nashtah Pup, which is a nice addition – I was surprised at first that we don’t actually get a headhunter model, but it would most likely drive the price of the expansion up to include it and, as was pointed out to me, most Scum players will have Most Wanted anyway. So it’s a pretty exciting release, and since I’ve started to play this game, I’m really looking forward to it! Speaking of X-Wing, we’ve also had a more in-depth look at the Imperial Raider, which I feel has been on the horizon for months already! 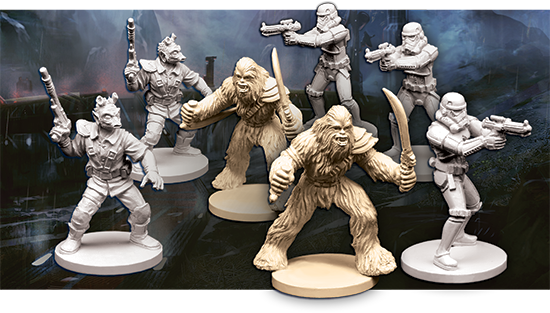 More reinforcements have been announced for Imperial Assault, too. As someone mentioned on facebook, this is where the skirmish game really begins, and I can definitely see that. Up to now, we seem to have been having the lieutenant-like expansions similar to the Descent model, which basically replace tokens from the base game with actual miniatures, but with new chaps that we can bring to the table, it begins to feel much more like a miniatures battle game, much like the previous Star Wars Miniatures games from Wizards of the Coast and West End Games. Even though I haven’t been able to play with the base game yet, I’m hoping I can sell the idea to Tony with the skirmish side, then hook him in with the scenario-driven game. We shall see! The miniatures do look great, though I’m not going to paint them – the manager at the local store has done his store copy, and that looks fantastic, but they’re too small and detailed for me! Again, I’m pretty excited for these guys, even though I’ve yet to play the game. Star Wars Miniatures was one of my favourite games, back in the day – which is surprising, given that it’s got basically no story to it, and you’re just trying to wipe out your opponent before he wipes you out. But I played a lot of that game back in the day, and it’s really exciting to think we might get that sort of experience again, though on a much more sensible scale (as opposed to the blind-buy from Wizards). Making splendid use of my amazon vouchers, I’ve decided to go for the latest novels in hardcover. It seems Del Rey is moving to all their books coming out in hardcover now, so it’ll help to distinguish them from my now-Legends novels. Author spalanzPosted on April 24, 2015 April 24, 2015 Categories board games, Star WarsTags Fantasy Flight Games, Imperial Assault, Star Wars, X-WingLeave a comment on New Star Wars stuff! Q: will #ImperialAssault or SWRPG ever focus on the empires side? @FFGames: something we are considering, nothing definitive. So soon after the GAMA Trade Show stuff for Armada and Imperial Assault, we’re given yet more Star Wars goodness from FFG at this weekend’s Star Wars Celebration in Anaheim! Yes, I still haven’t played Imperial Assault, and while the expansion model of lots of small packs of miniatures is a little worrying for the bank balance, it is nevertheless pretty exciting to see the game expand in this modular way, as you can pick and choose what you want – especially for the skirmish play, but also adding in actual miniatures for the scenario stuff is cool. Anyhow, it’s good to see all the lines looking healthy, and the promise of lots more Star Wars games to come! The Lando story sounds like it could be good. Of course, I’m a big fan of AC Crispin’s Han Solo trilogy, and don’t really relish the idea of that being wiped away, but the comic is set sometime between Rebel Dawn and The Empire Strikes Back, so it’s possible that nothing will contradict the Bantam series there. We’ve known what has happened since 1990, and Heir to the Empire, thank you very much! Bah! So it’s with a degree of trepidation, and some scepticism, that I’ll most likely be reading this book when it comes out in September. 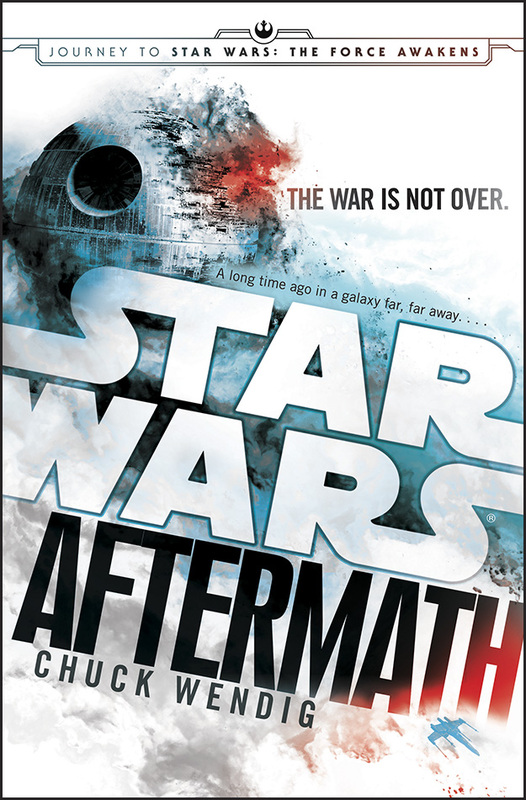 So while I’m still a bit sad about the loss of the EU as I knew it, the one bright spot on the horizon comes from this article on sw.com about the upcoming novel Aftermath, part of a trilogy that bridges the gap between episodes VI and VII with both new characters and “familiar faces”. Maybe Talon Karrde and Mara Jade live, after all? For all my love of the EU that I’ve just discussed, it’s something that I actually feel Bantam didn’t do all that well – the Empire fell at Endor insofar as the Emperor and Vader died, but what happened to the galaxy at large? Somehow, that epic sweep that the new trailer seems to sum up so nicely in the depiction of a crashed Star Destroyer was lost, and instead we got the X-Wing series, which was basically a set of novels showcasing just how awesome Corran Horn is as a person. But I’ve had that rant before. We do somehow lack that immediate sense of, just what the hell happened next? Author spalanzPosted on April 18, 2015 April 18, 2015 Categories board games, Star Wars, Star Wars comics, Star Wars novelsTags Aftermath, comics, Fantasy Flight Games, games, Imperial Assault, Imperial Entanglements, Marvel, Star Wars, Star Wars Celebration, Star Wars games, X-WingLeave a comment on More Star Wars! It has been a bit of a sparse week for gaming news, I have to say. The most exciting thing, for me, was a look at two of the upcoming ally packs for Imperial Assault, here. To my shame, Imperial Assault remains unplayed since I got it at Xmas, so just how excited I am for more content for a (currently) unplayed game is a bit of an issue. But we’ll see. Of course, I got another game of X-Wing in at the local games shop, a hilarious adventure among the asteroids that you can read about here! I was pretty excited about this one, actually, which perhaps is a bit strange given the fact that I haven’t played a role-playing game in years! I’ve been on a bit of a nostalgia trip of late, started off by my D&D week earlier in the year, and since then, I’ve been looking back with fondness at my Star Wars RPG days. I’ve not properly looked over the latest incarnation of the game from FFG, but I recall feeling positive about it when Edge of the Empire first appeared, so even though my chances of playing soon are pretty slim, I’m nevertheless thinking of featuring a look at the thing here on my blog sometime soon. While West End Games did an awful lot to make a credible universe, tying in very closely with the Bantam novels of the 90s, then Wizards of the Coast largely ignored all of that as they just kept churning out movie-related material, it seems FFG is going on its own way of providing adventures almost unconnected to previous material, and it looks pretty amazing for it! 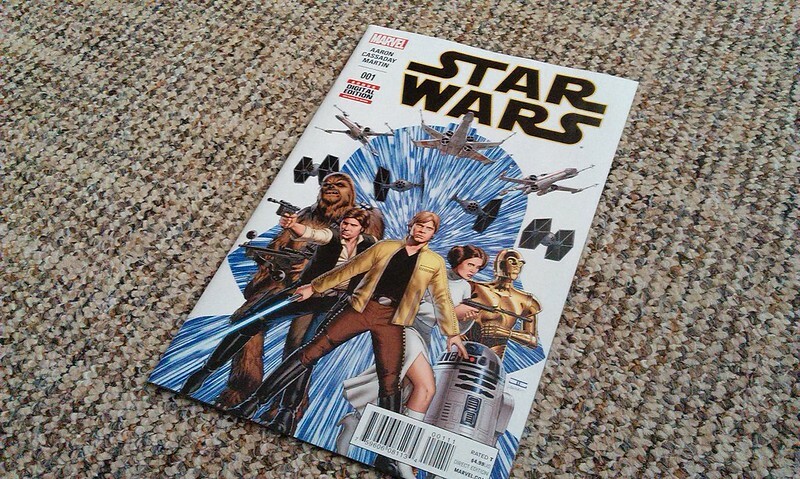 On the subject of Star Wars, I read the first issue in the new Marvel series today! Going back to D&D week, I also finished reading The Halfling’s Gem, which turned out to be pretty good in the end! Being pulled into Tarterus near the end seemed a bit extraneous, but maybe that’s just me. After, what, eighteen months or so of being left, it was good to finally finish the trilogy! I’ve since moved onto The Legacy, the seventh book in the series, and while I’m only a couple of chapters in, it’s definitely setting up a compelling story. I had kinda spoiled myself for this book through the adventure system game. [SPOILER ALERT!] 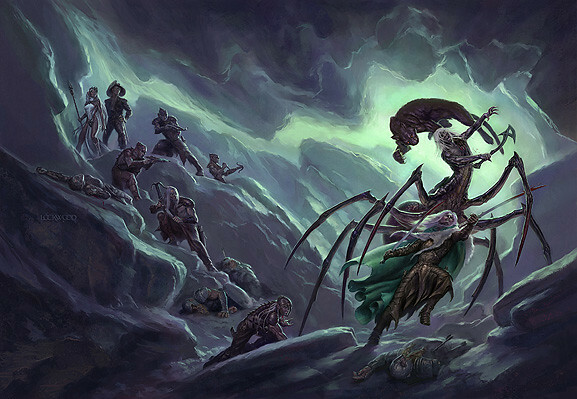 In the game, Drizzt’s brother Dinin Do’Urden appears as a drider, and after starting to read the Dark Elf trilogy I was a little confused, before finding out that happens in the course of book seven. Plus, the cover does kinda give it away! I really loved the Dark Elf trilogy, books one and two in particular were just too awesome for words, and a big part of my enjoyment came from the setting. Menzoberranzan is one of the most interesting locations I’ve ever had the pleasure to read about, and the whole adventures in the Underdark was a real joy, so the interruption on the surface for the last three books has been a bit unwelcome, really! Good to get back underground, even if it is currently only for part of the book. The Legacy takes place nearly twenty years after Drizzt left the Underdark in Sojourn, and it’s fun to see what has been happening with the drow characters in the time Drizzt has been away. Promises to be a good read, anyway! I’ve also been painting more Necrons this weekend! I must admit, I’m quite pleased with myself! Having had such a slow start to painting this year, I’m glad to finally be creating again! I’ve made up a batch of Immortals, and have been painting them as Pyrrhian Eternals, the dedicated Immortals of Anrakyr the Traveller! I’ve recently begun to use my flickr account once more, where you can head over to check out my album here! I hope you’ve all been having a wonderful day, whether you’re choosing to celebrate the religious festival, or just having a damn awesome Thursday! 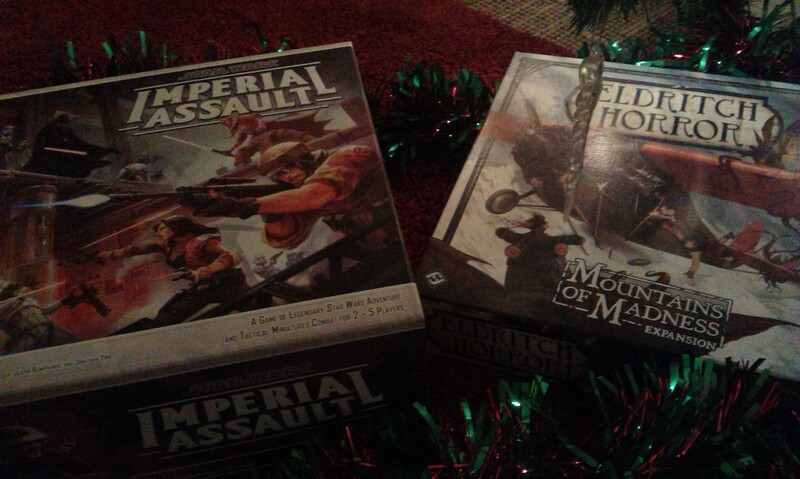 Author spalanzPosted on December 25, 2014 Categories board gamesTags Christmas, Eldritch Horror, Fantasy Flight Games, Imperial Assault, Star Wars3 Comments on Merry Christmas! Yep, I’m done for the festive period now! 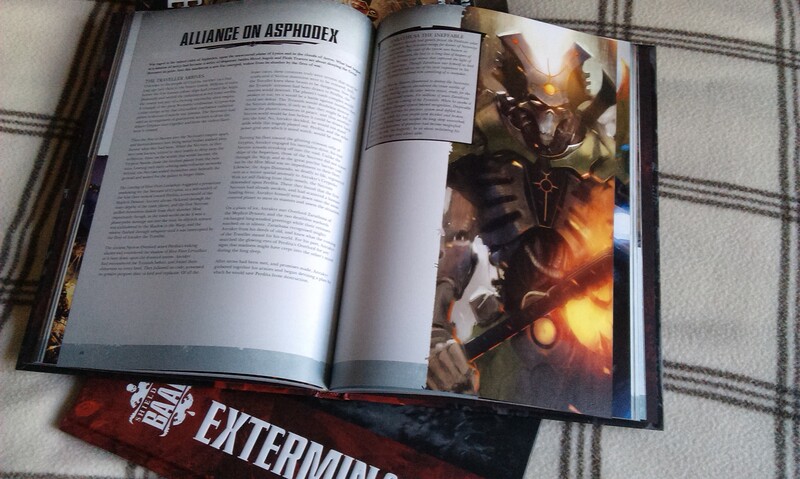 It was my birthday on Thursday, and I’d bought the second Shield of Baal campaign book for myself, so picked that up today – that was exciting stuff! 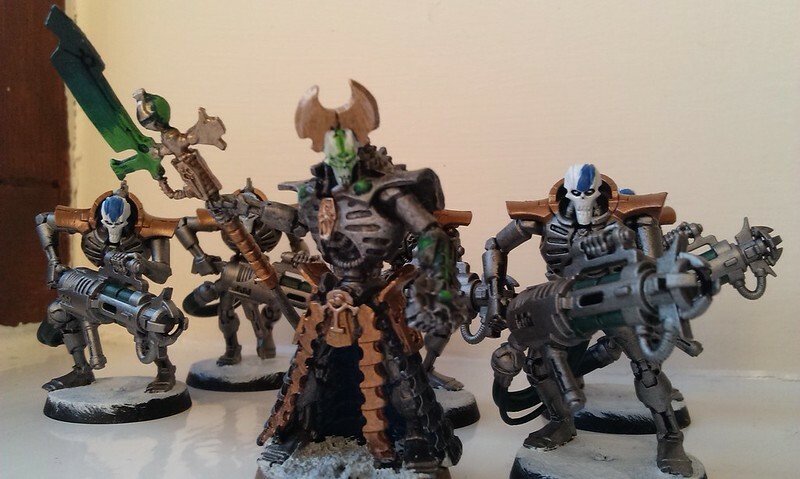 I mean: Necrons! So far, I’ve been really enjoying this campaign. Of course, I’m still not a player of the game, as I’m taking my time with building up my Necron army while I wait for the new codex to hit (I think I’ve gone on about this for quite some time now), however I’ve been digesting the novellas that have been published to support all this bumph, and have so far been really impressed! I finished the Deathstorm novella this morning, which is one of the best tie-in stories I’ve ever read, to be honest! I also picked up the third novella in this series this morning, so once I’ve read that, I’ll be bringing some words of wisdom to you all on that! The base colours are done, so I’m going to do some washing and highlighting soon (hopefully tomorrow), then glue those scarabs onto the poor bloke, and job done! 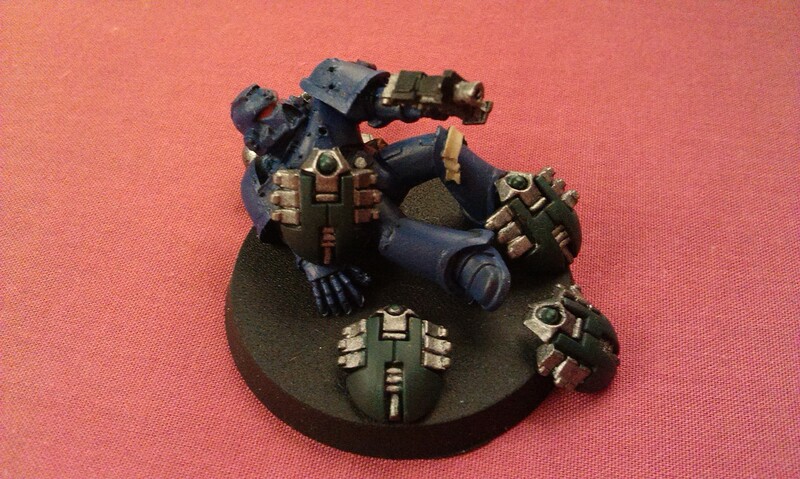 For my second painting effort of a space marine, I don’t think it’s half bad, anyway! There was a minor flurry of releases from Fantasy Flight last week. Imperial Assault is probably the most notable here, of course – £80 of game, and it looks like you really get some bang for that buck! Down at my local games shop, the manager gave me a quick tour of the game on Wednesday – you basically get a game like Descent, with tiles and miniatures and cards and tokens, but then you get (I think) four rulebooks to suppose the other style of play, skirmish play. On top of that, you also get two mini-expansions, the Luke Skywalker ally pack, and the Darth Vader villain pack. 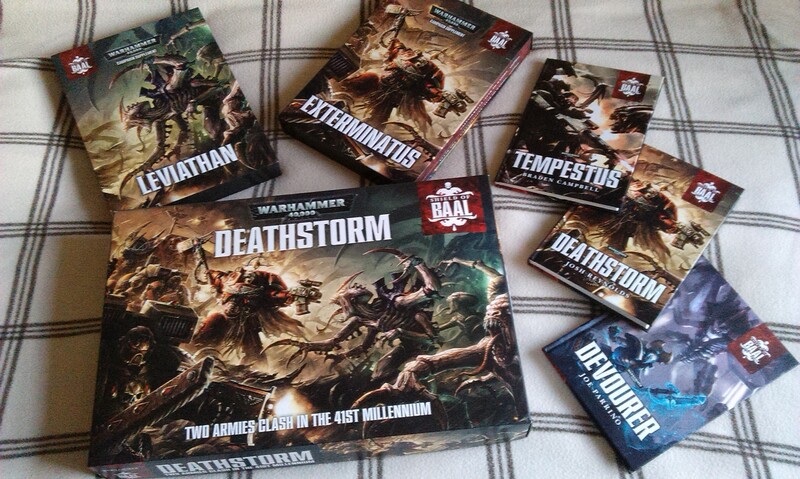 These are apparently similar to the lieutenant packs for Descent, with cards for various bits as well as miniatures, which replace tokens in the main game. Mountains of Madness has also been released, which kinda excites me much more than Imperial Assault – aside from the fact that it can be played solo, which is always exciting, I had the base game last xmas, so it’s a nice little repeat of that to have the first big-box expansion this year! It’s currently nestled under my tree, awaiting the big day, so I’m really very excited by this! First reaction, there are more nuances to this game than I was initially aware of. It’s not just a re-implemented X-Wing – while there are undeniably similarities to the earlier game, Armada does seem like it could be an enjoyable wargame rather than the dogfighting game of X-Wing. I mean, X-Wing feels like a really nice, well thought-out skirmish game between a group of starships, but Armada really succeeds with having the sense of the players being admirals in charge of rival fleets. The inevitable problem, of course, is scaring up someone who would be willing to play this game with me. My regular gaming buddy is no fan of X-Wing, so I doubt he’ll get into this one. It’s a hell of a lot of money to drop on something that might never actually see a play, of course, as well. So…hm. I’m at least feeling a lot more open to the idea of the game than I was in the summer, so that, if nothing else, is worth writing about! Author spalanzPosted on December 20, 2014 Categories board games, WarhammerTags Armada, Battlelore, Eldritch Horror, Fantasy Flight Games, Imperial Assault, Lovecraft, Mountains of Madness, Necrons, Shield of Baal, Warhammer 40kLeave a comment on Off for the holidays!